These beautiful botanical prints date from the early years of Curtis's Botanical Magazine. 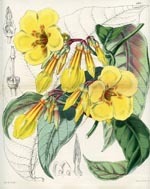 The Botanical Magazine is one of the oldest - and longest published - of the British horticultural magazines (1787-1983). Founded by William Curtis, management and editorship of the Magazine was taken over by John Sims in 1799 upon the death of Curtis. All of the prints shown on this page are based on illustrations by the Scottish-born botanical artist Walter Hood Fitch (1817-1892).